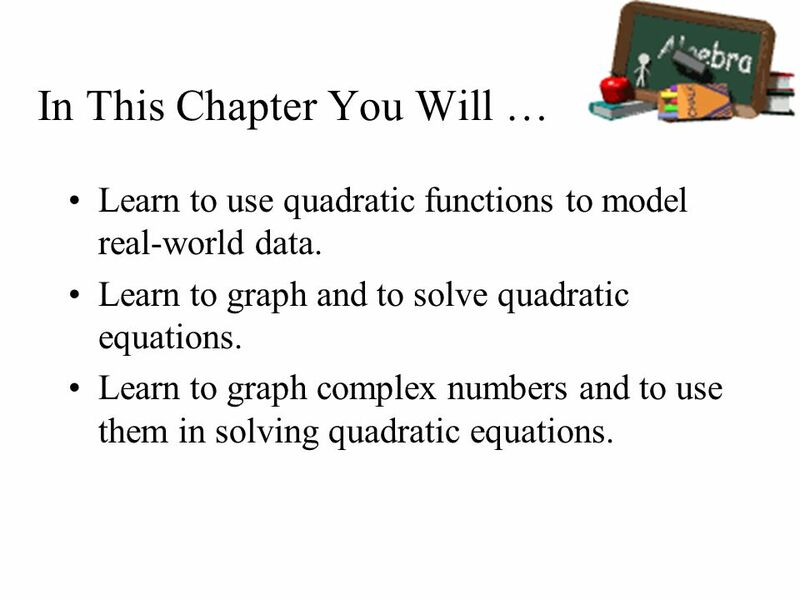 Learn to use quadratic functions to model real-world data. 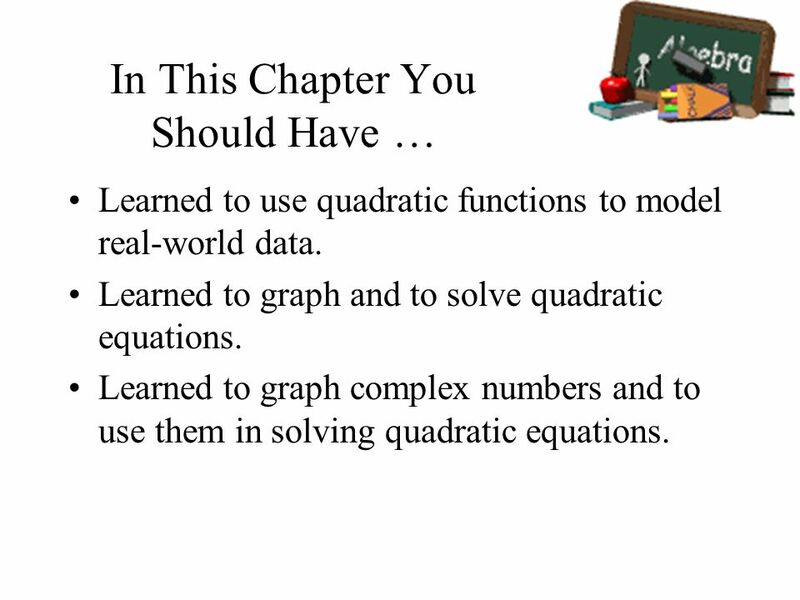 Learn to graph and to solve quadratic equations. 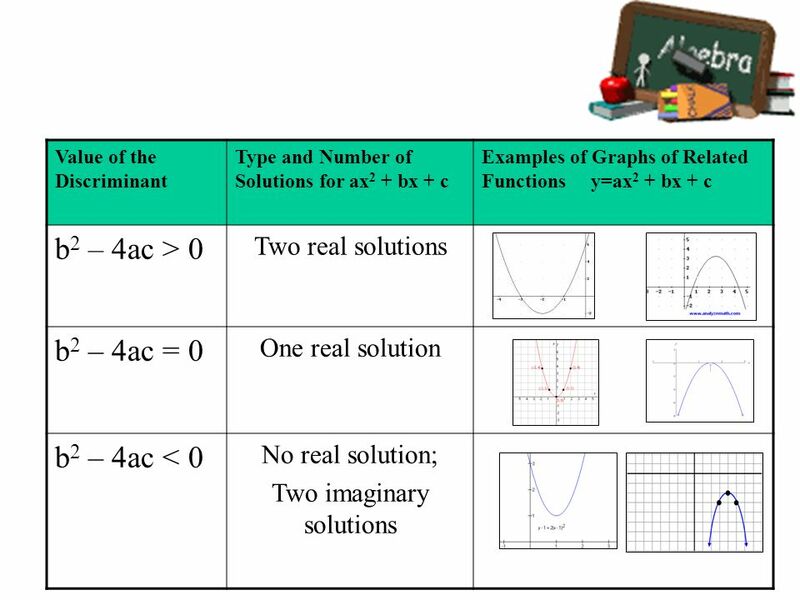 Learn to graph complex numbers and to use them in solving quadratic equations. 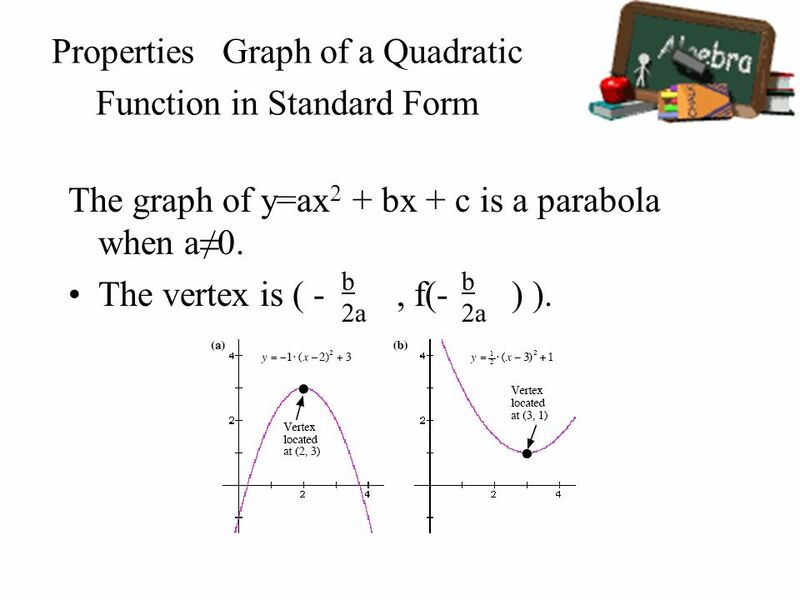 6 The graph of a quadratic function is a parabola. 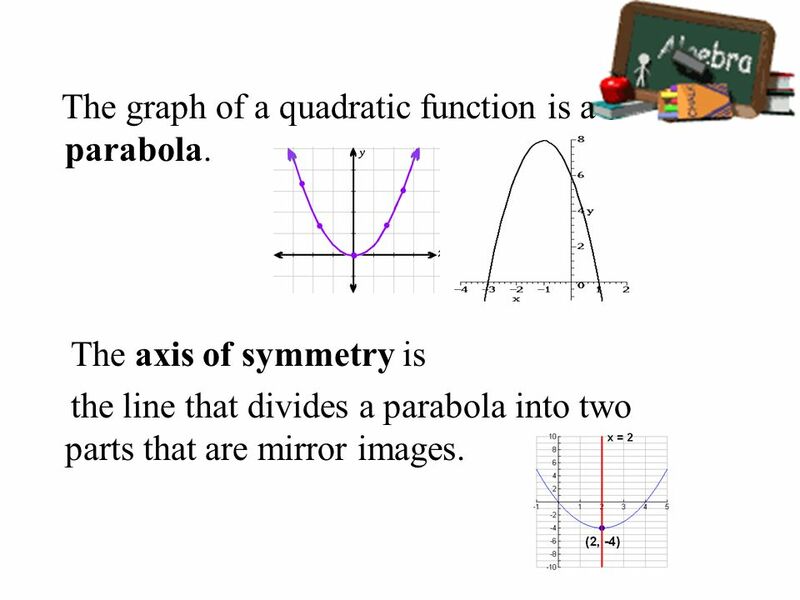 The axis of symmetry is the line that divides a parabola into two parts that are mirror images. 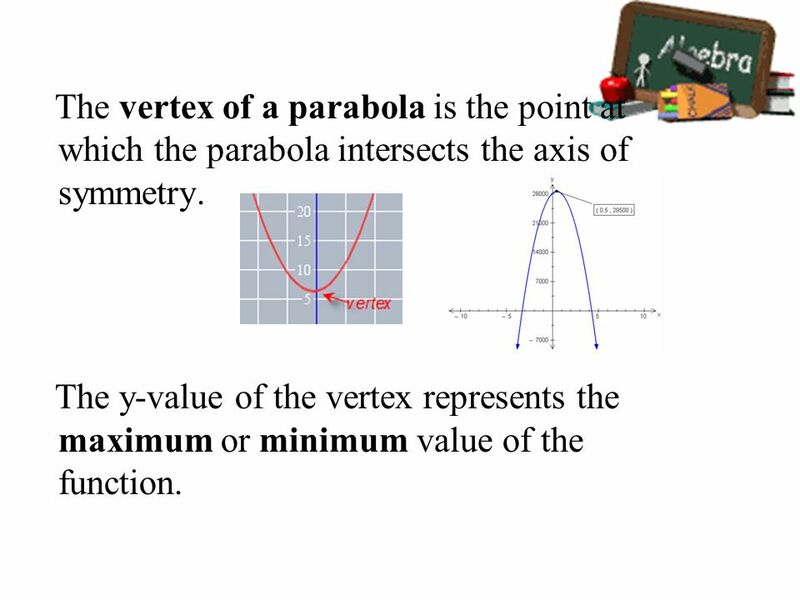 7 The vertex of a parabola is the point at which the parabola intersects the axis of symmetry. 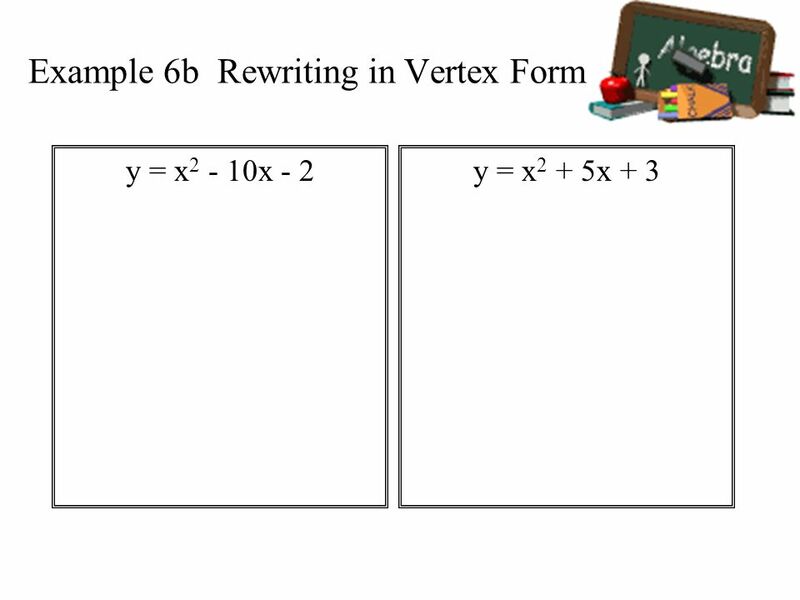 The y-value of the vertex represents the maximum or minimum value of the function. Y 2 3 13 4 29 Find a quadratic function to model the values in the table. 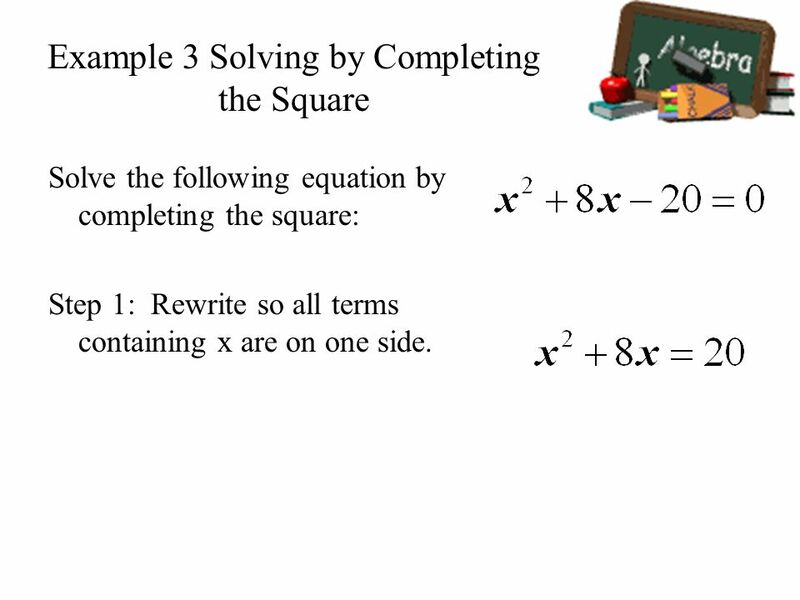 Substitute the values of x and y into y = ax2 + bx + c. The result is a system of three linear equations. 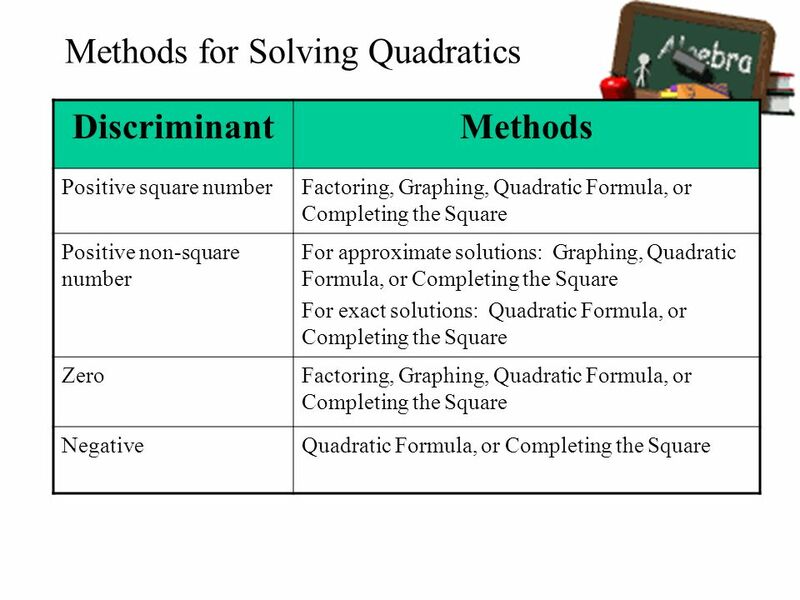 Y 1 2 -3 3 -10 Find a quadratic function to model the values in the table. Substitute the values of x and y into y = ax2 + bx + c. The result is a system of three linear equations. The table shows the height of a column of water as it drains from its container. 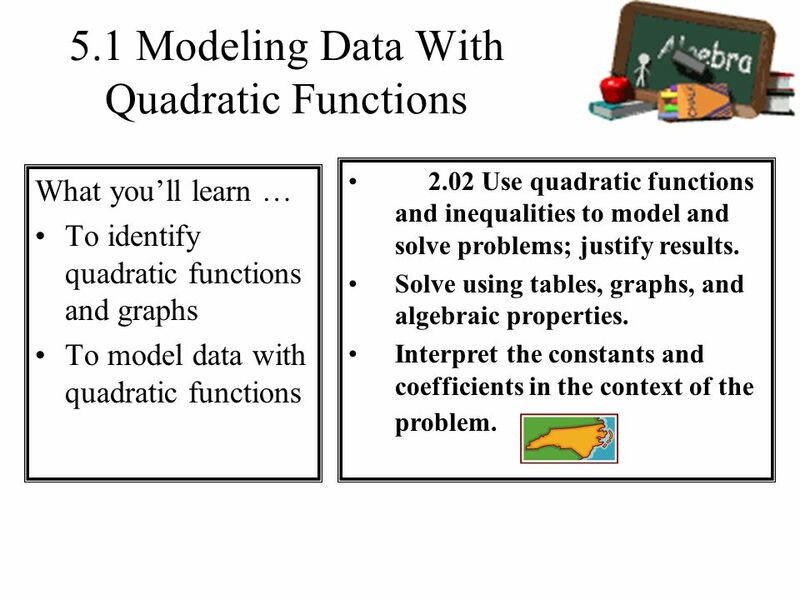 Model the data with a quadratic function. Graph the data and the function. 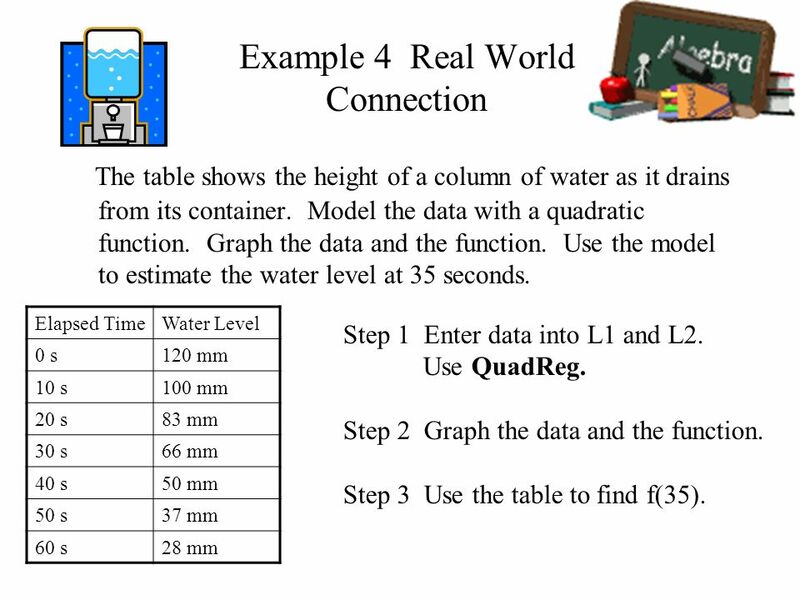 Use the model to estimate the water level at 35 seconds. Elapsed Time Water Level 0 s 120 mm 10 s 100 mm 20 s 83 mm 30 s 66 mm 40 s 50 mm 50 s 37 mm 60 s 28 mm Step 1 Enter data into L1 and L2. 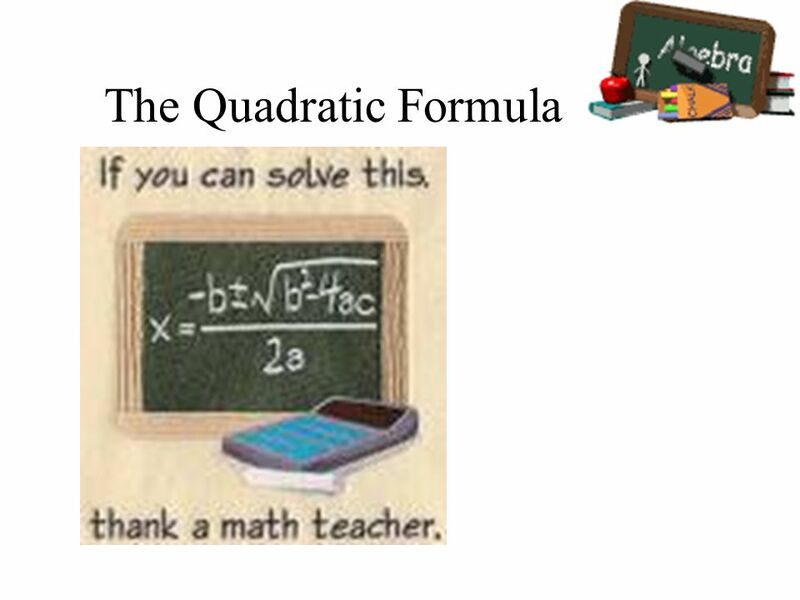 Use QuadReg. 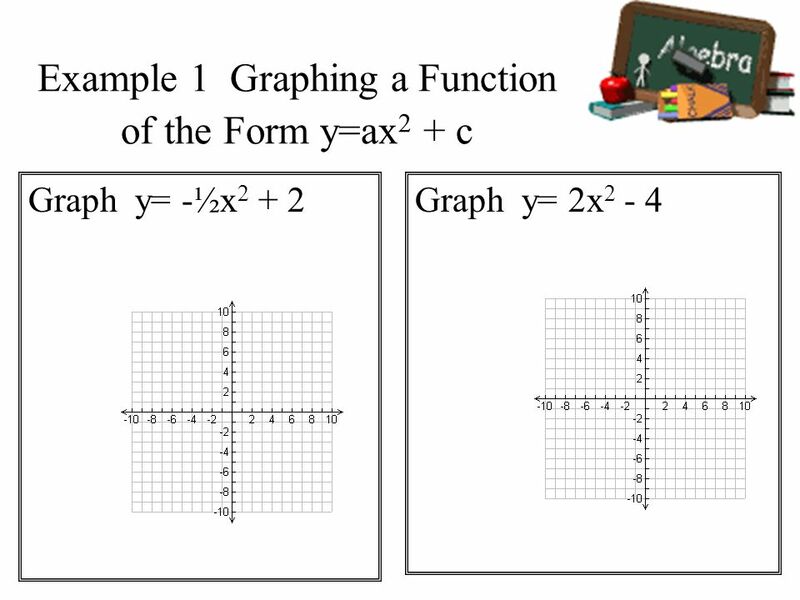 Step 2 Graph the data and the function. 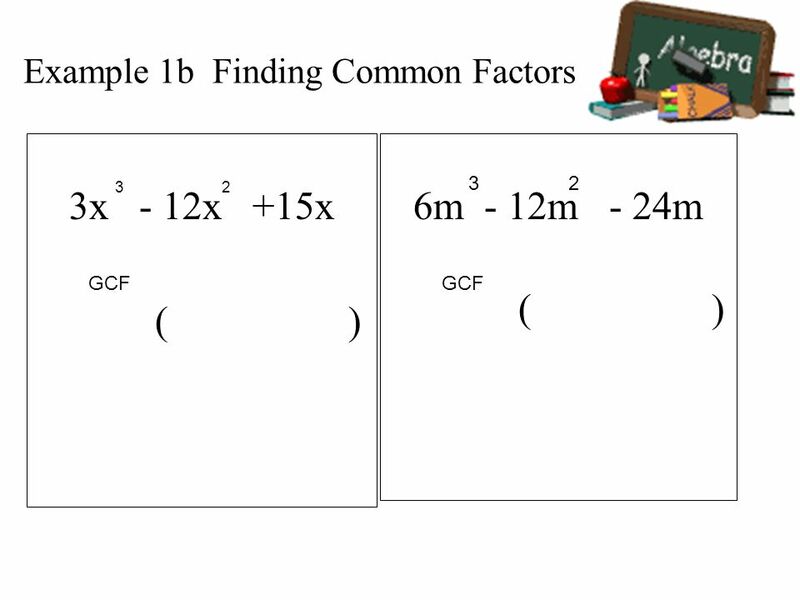 Step 3 Use the table to find f(35). 14 Graphing Parabolas The standard form of a quadratic function is y=ax2 + bx + c. When b=0, the function simplifies to y=ax2 + c. The graph of y=ax2 + c is a parabola with an axis of symmetry x =0, the y-axis. The vertex of the graph is the y-intercept (0,c). 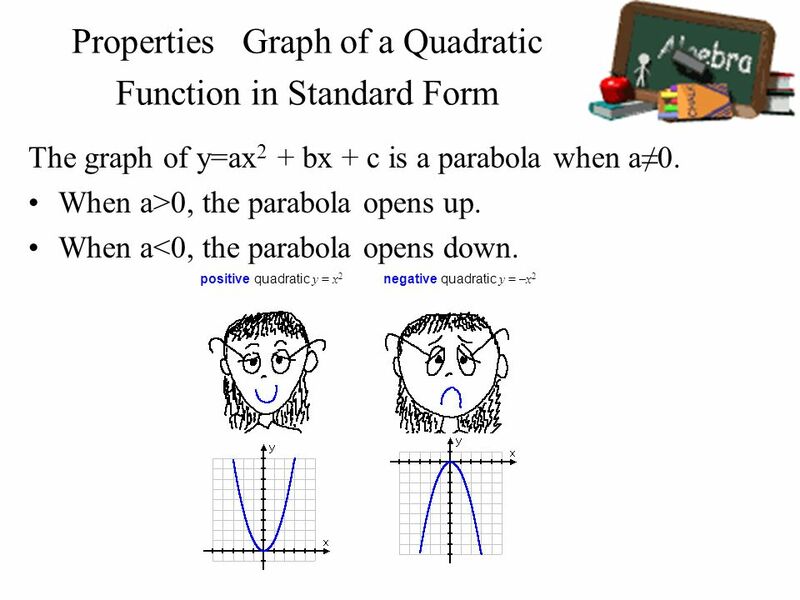 The graph of y=ax2 + bx + c is a parabola when a≠0. The y intercept is (0,c). 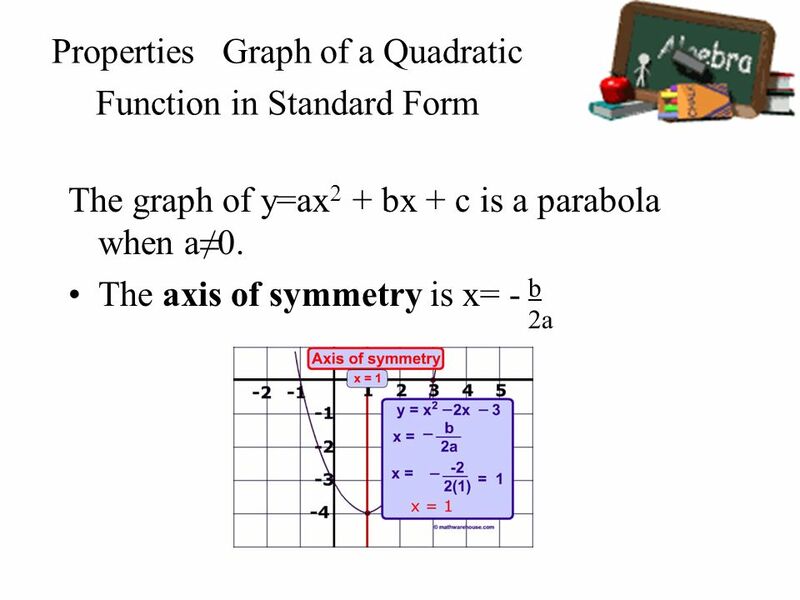 19 Quadratic Graphs 2 y = x The graph of a quadratic function is a U-shaped curve called a parabola. .
21 Symmetry 2 y = x + 3 You can fold a parabola so that the two sides match evenly. This property is called symmetry. The fold or line that divides the parabola into two matching halves is called the axis of symmetry. 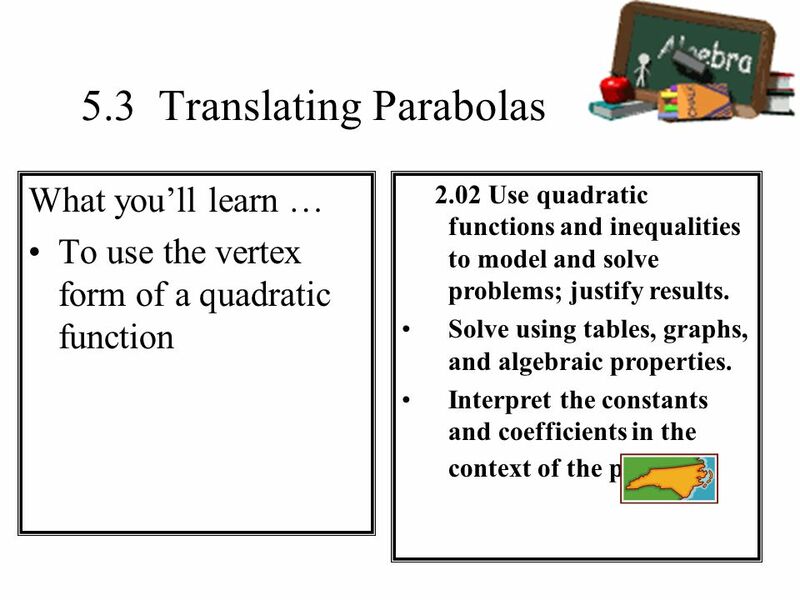 What you’ll learn … To use the vertex form of a quadratic function 2.02 Use quadratic functions and inequalities to model and solve problems; justify results. Solve using tables, graphs, and algebraic properties. Interpret the constants and coefficients in the context of the problem. 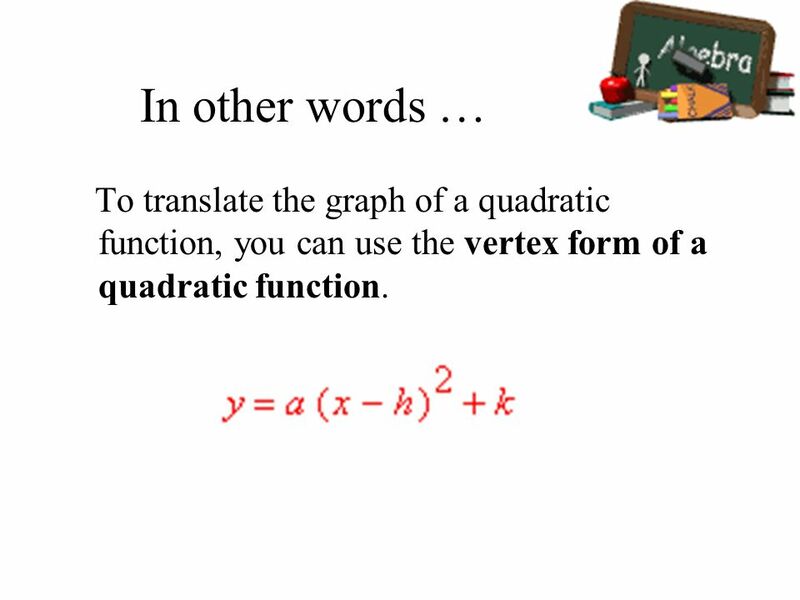 26 In other words … To translate the graph of a quadratic function, you can use the vertex form of a quadratic function. 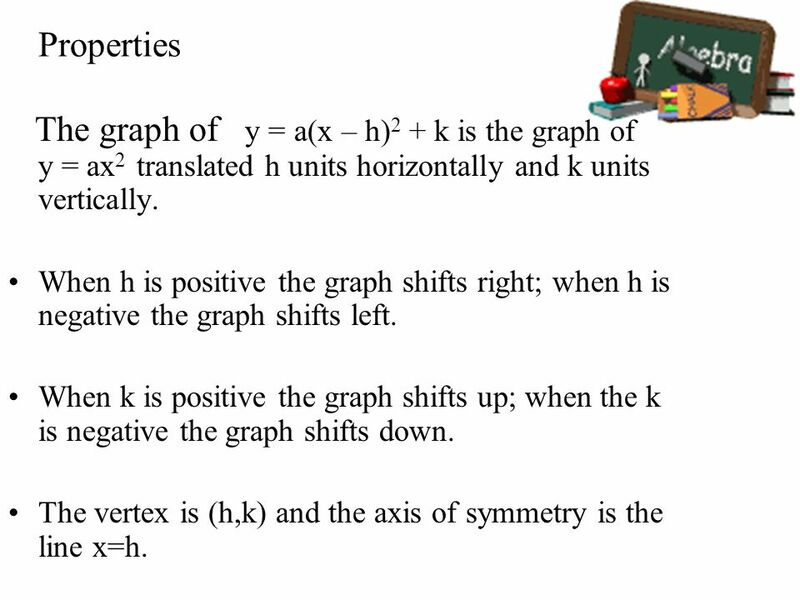 27 Properties The graph of y = a(x – h)2 + k is the graph of y = ax2 translated h units horizontally and k units vertically. When h is positive the graph shifts right; when h is negative the graph shifts left. When k is positive the graph shifts up; when the k is negative the graph shifts down. 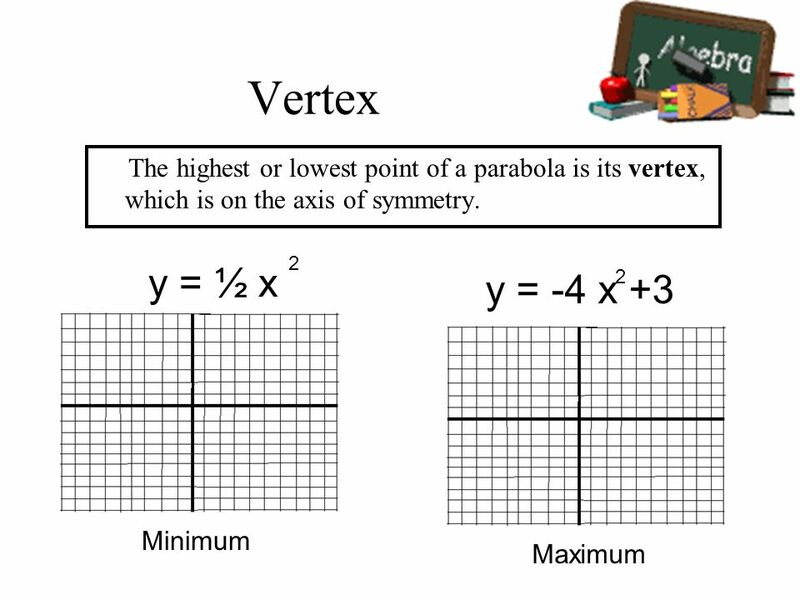 The vertex is (h,k) and the axis of symmetry is the line x=h. 2 Graph y = - (x-2)2 +3 Graph the vertex. Draw the axis of symmetry. Find another point. When x=0. Sketch the curve. Graph y = 2 (x+1)2 - 4 Graph the vertex. Draw the axis of symmetry. Find another point. When x=0. Sketch the curve. 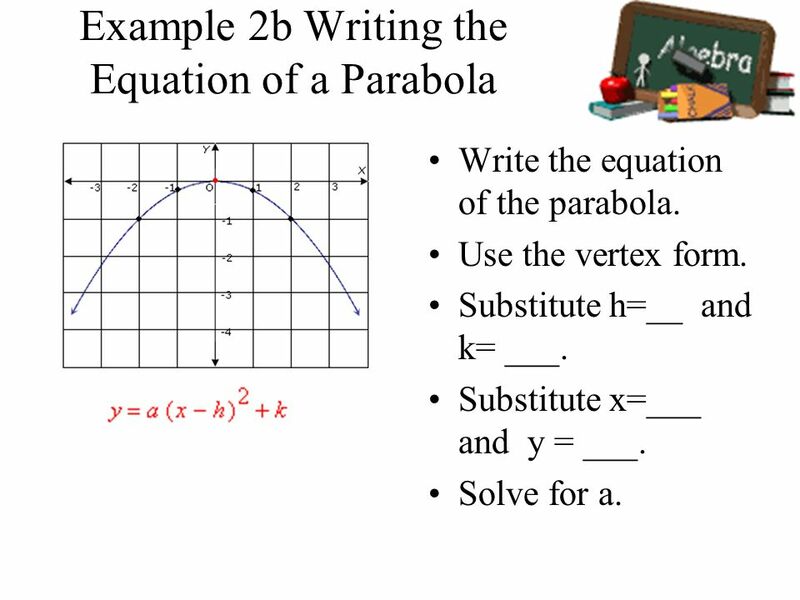 Write the equation of the parabola. 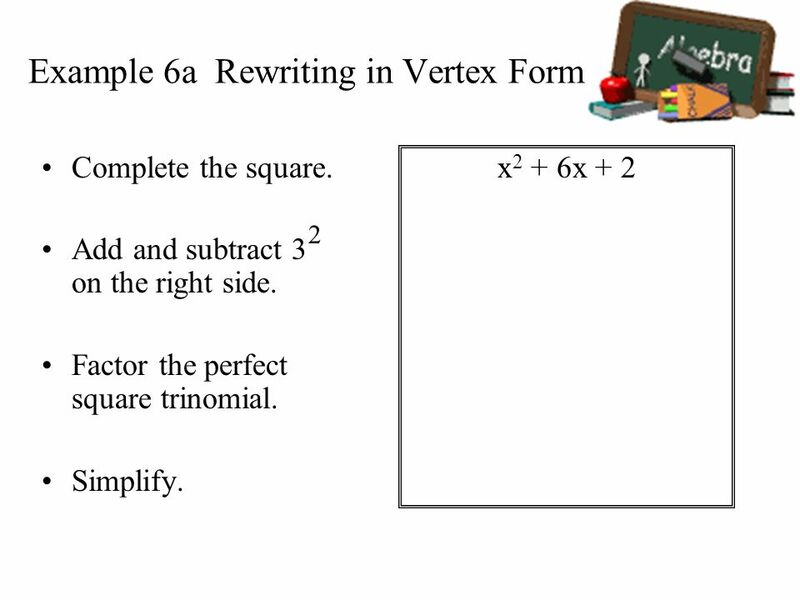 Use the vertex form. Substitute h=__ and k= ___. Substitute x=0 and y = 6. Solve for a. 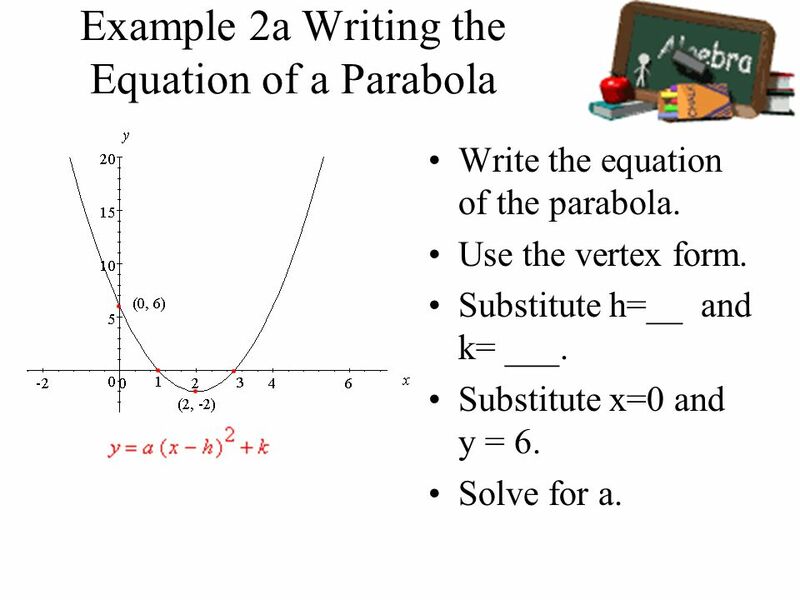 Write the equation of the parabola. Use the vertex form. Substitute h=__ and k= ___. Substitute x=___ and y = ___. 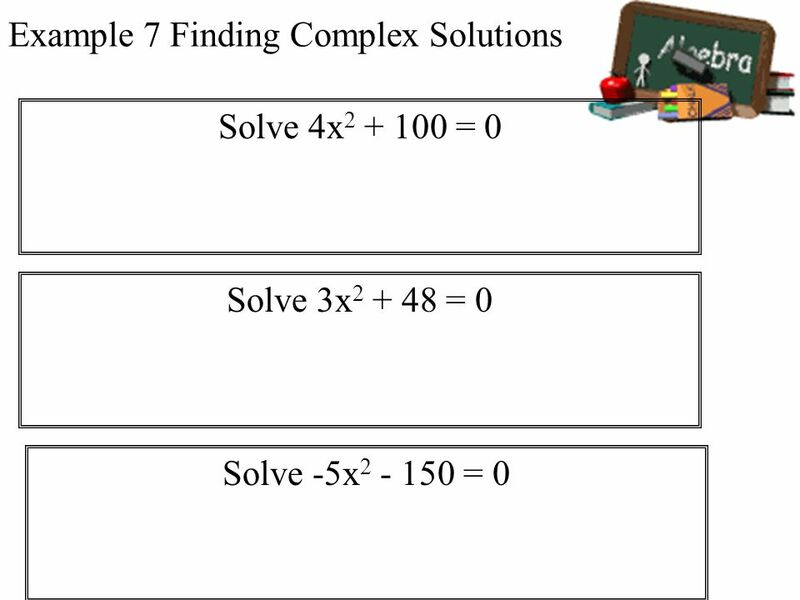 Solve for a. 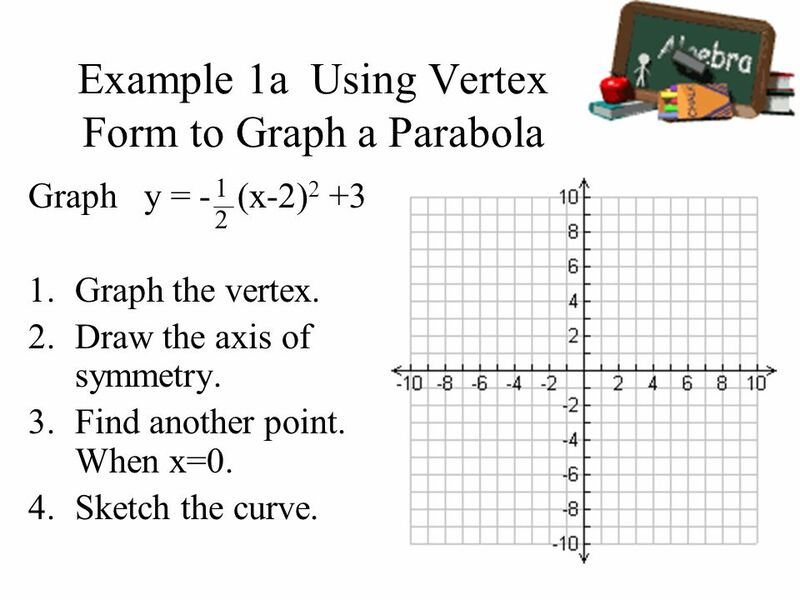 Write the equation of a parabola that has vertex (-2, 1) and goes thru the point (1,28). 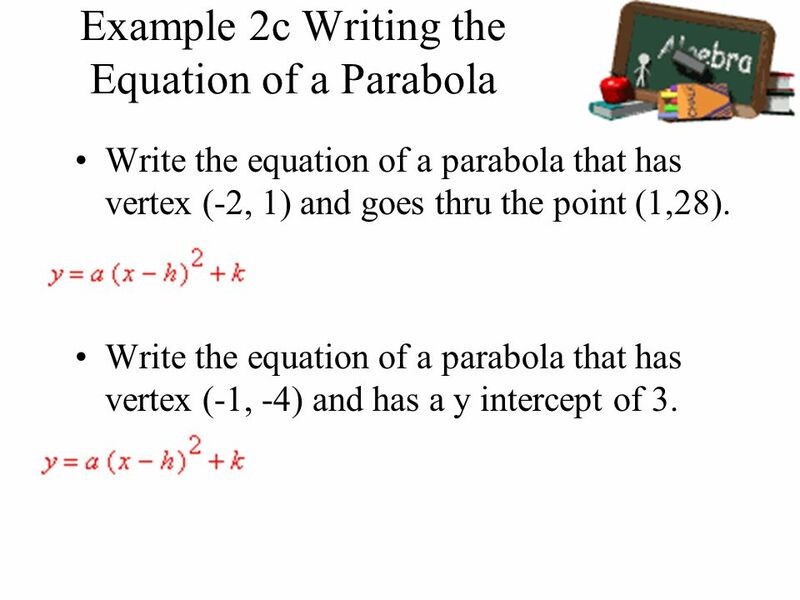 Write the equation of a parabola that has vertex (-1, -4) and has a y intercept of 3. 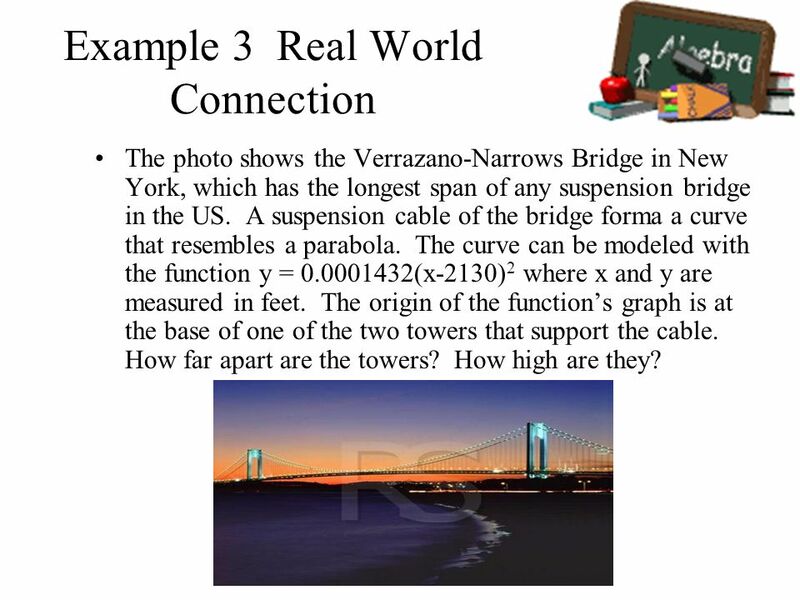 The photo shows the Verrazano-Narrows Bridge in New York, which has the longest span of any suspension bridge in the US. A suspension cable of the bridge forma a curve that resembles a parabola. The curve can be modeled with the function y = (x-2130)2 where x and y are measured in feet. The origin of the function’s graph is at the base of one of the two towers that support the cable. How far apart are the towers? How high are they? 36 Start by drawing a diagram. The function, y = (x-2130)2 , is in vertex form. Since h =2130 and k =0, the vertex is (2130,0). The vertex is halfway between the towers, so the distance between the towers is 2(2130) ft = 4260 ft. To find the tower’s height, find y for x=0. 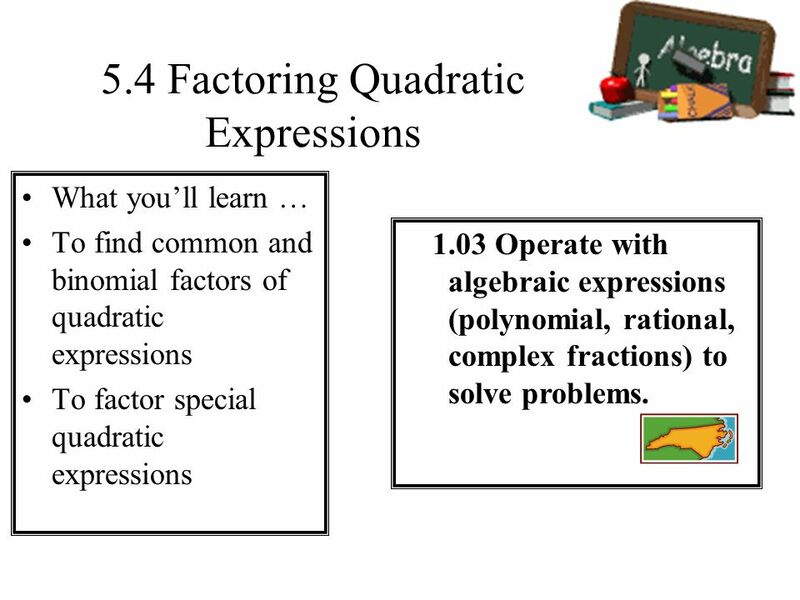 What you’ll learn … To find common and binomial factors of quadratic expressions To factor special quadratic expressions 1.03 Operate with algebraic expressions (polynomial, rational, complex fractions) to solve problems. 39 Factoring is rewriting an expression as the product of its factors. 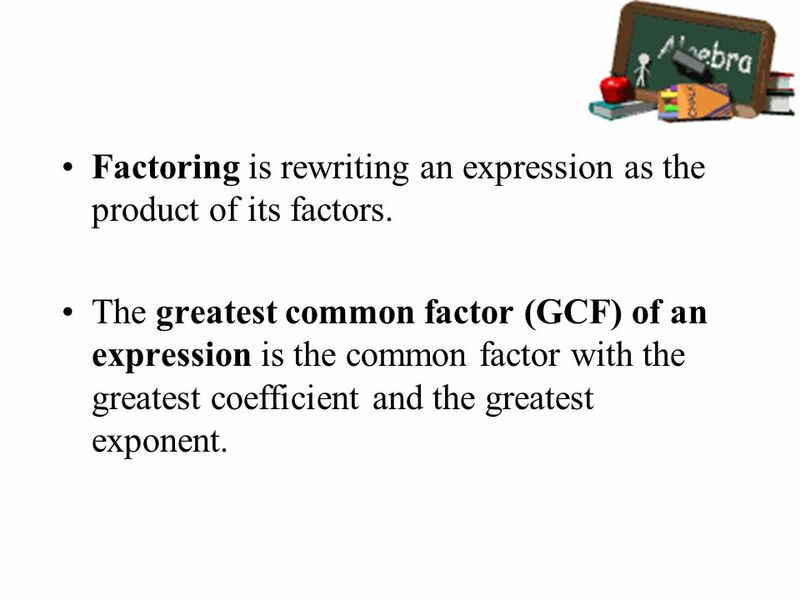 The greatest common factor (GCF) of an expression is the common factor with the greatest coefficient and the greatest exponent. 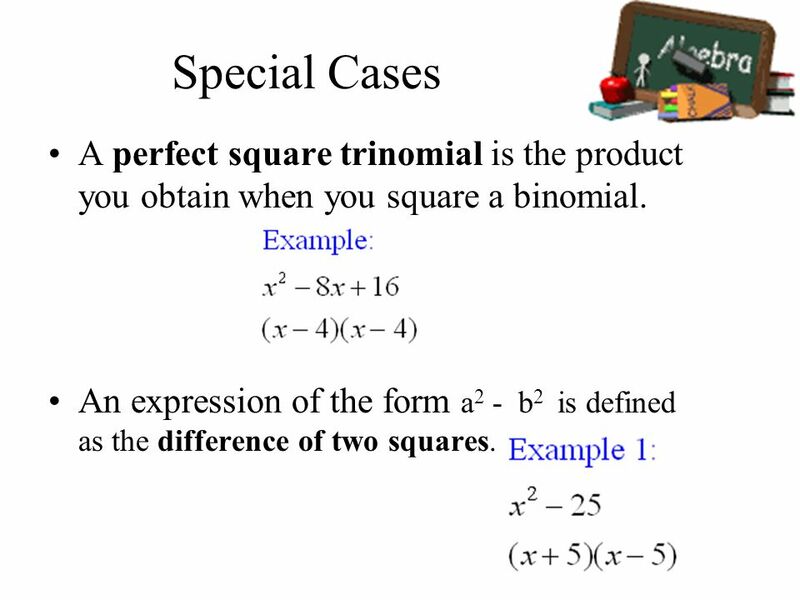 47 Special Cases A perfect square trinomial is the product you obtain when you square a binomial. 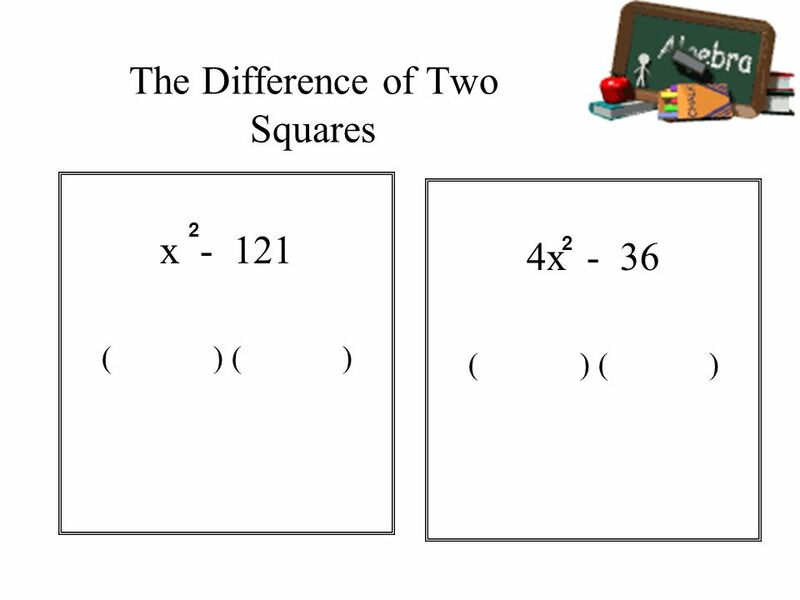 An expression of the form a2 - b2 is defined as the difference of two squares. To solve quadratic equations by factoring and by finding square roots To solve quadratic equations by graphing 2.02 Use quadratic functions and inequalities to model and solve problems; justify results. Solve using tables, graphs, and algebraic properties. Interpret the constants and coefficients in the context of the problem. 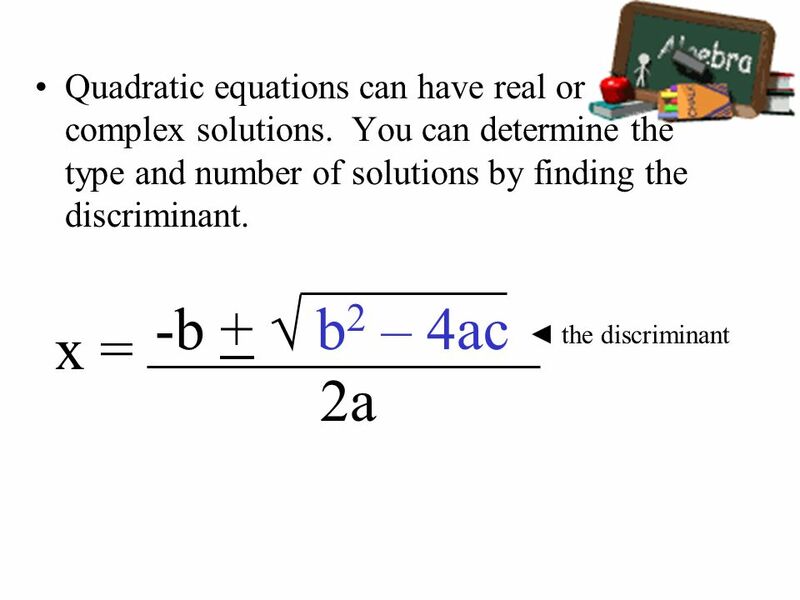 51 The standard form of a quadratic equation is ax2 + bx + c = 0, where a ≠ 0. You can solve some quadratic equations in standard form by factoring the quadratic expression and then using the Zero-Product Property. Zero-Product Property If ab = 0, then a =0 or b=0. Example If (x +3) (x -7) = 0 then (x +3) = 0 or (x -7) = 0. 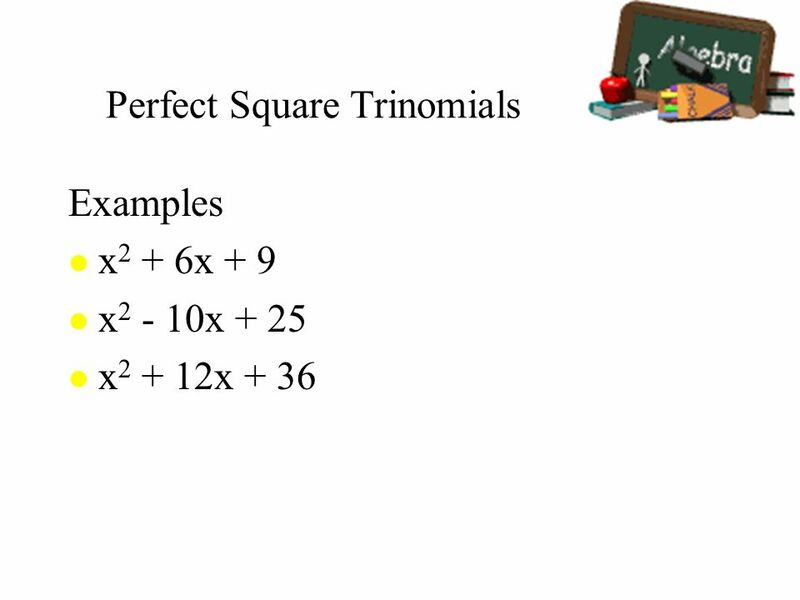 2 2 x – 4 = 0 x = 0 2 x = 0 The number of x intercepts determines the number of solutions!! 1. Set y= and graph with a standard window. 2. 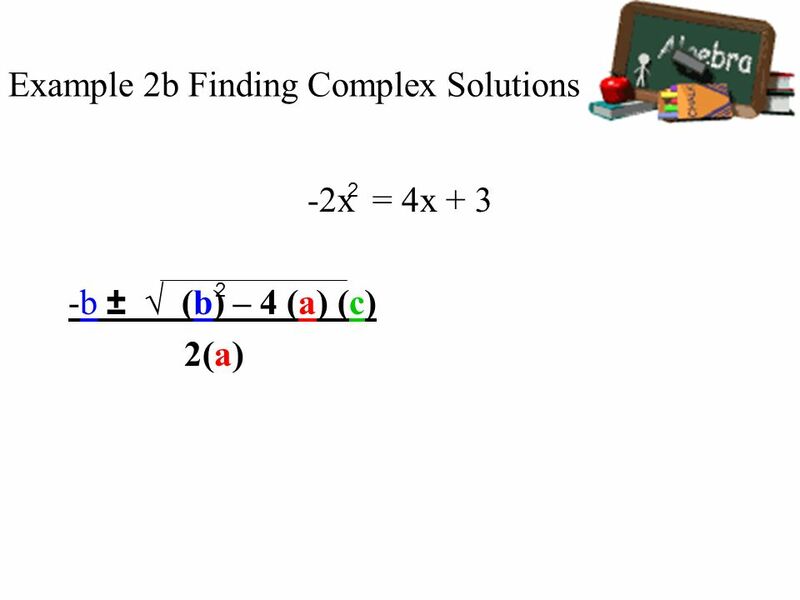 Use the ZERO command to find the roots -- 2nd TRACE (CALC), #2 zero 3. Left bound? 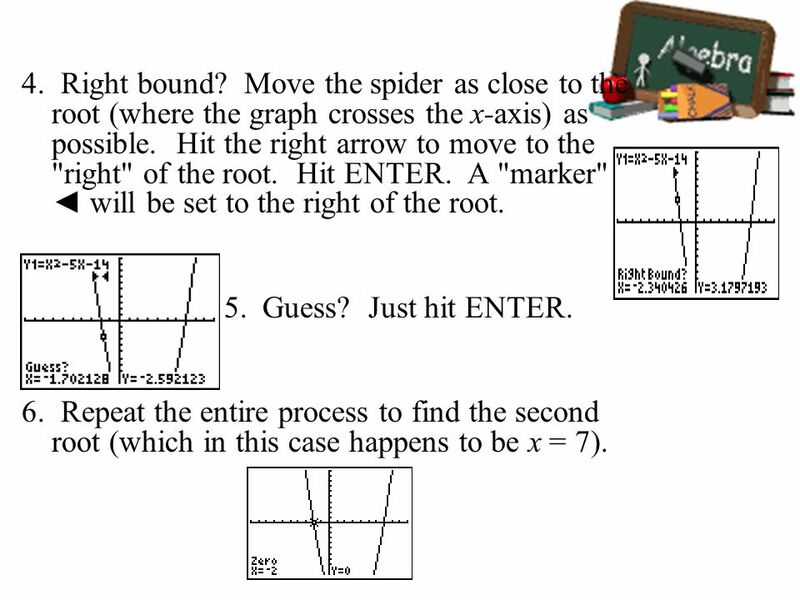 Move the spider as close to the root (where the graph crosses the x-axis) as possible. Hit the left arrow to move to the "left" of the root. Hit ENTER. A "marker" ► will be set to the left of the root. 58 4. Right bound? 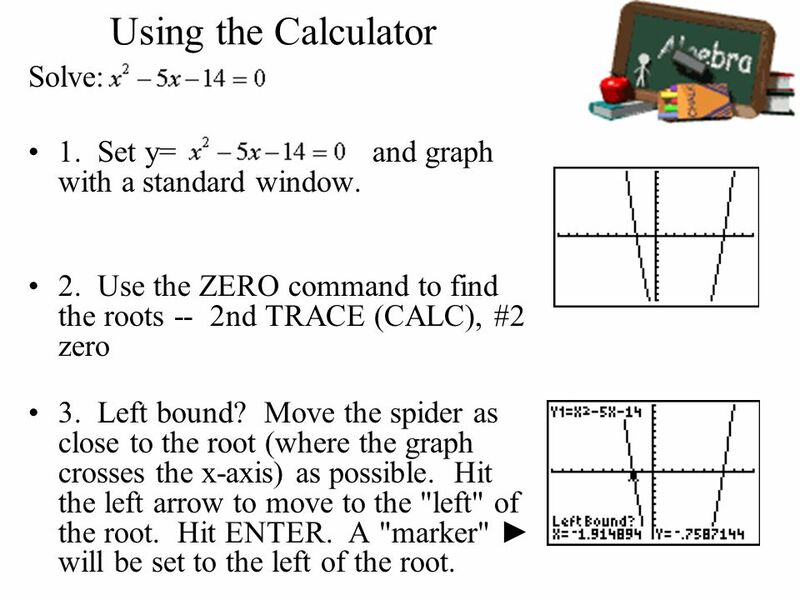 Move the spider as close to the root (where the graph crosses the x-axis) as possible. Hit the right arrow to move to the "right" of the root. Hit ENTER. A "marker" ◄ will be set to the right of the root. 5. Guess? Just hit ENTER. 6. Repeat the entire process to find the second root (which in this case happens to be x = 7). To identify and graph complex numbers To add, subtract, and multiply complex numbers 1.02 Define and compute with complex numbers. When you learned to count, you used natural numbers 1,2,3, and so on. 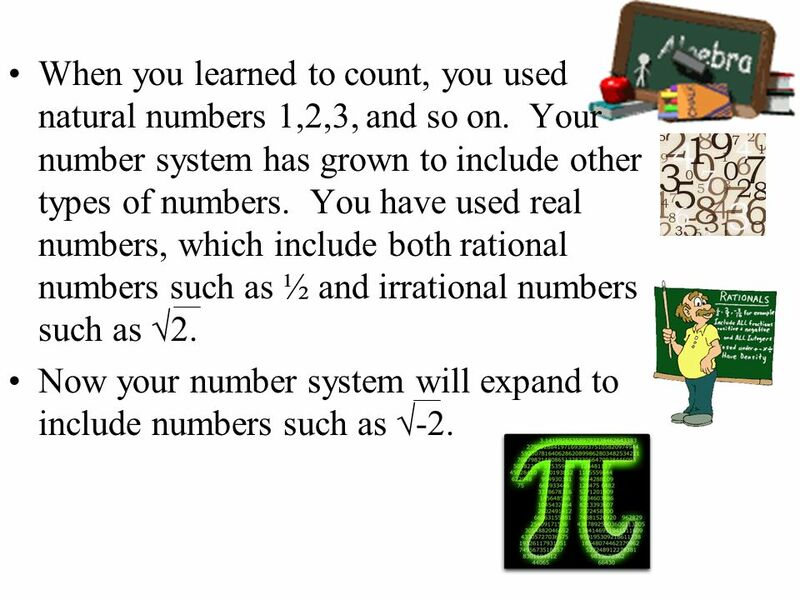 Your number system has grown to include other types of numbers. 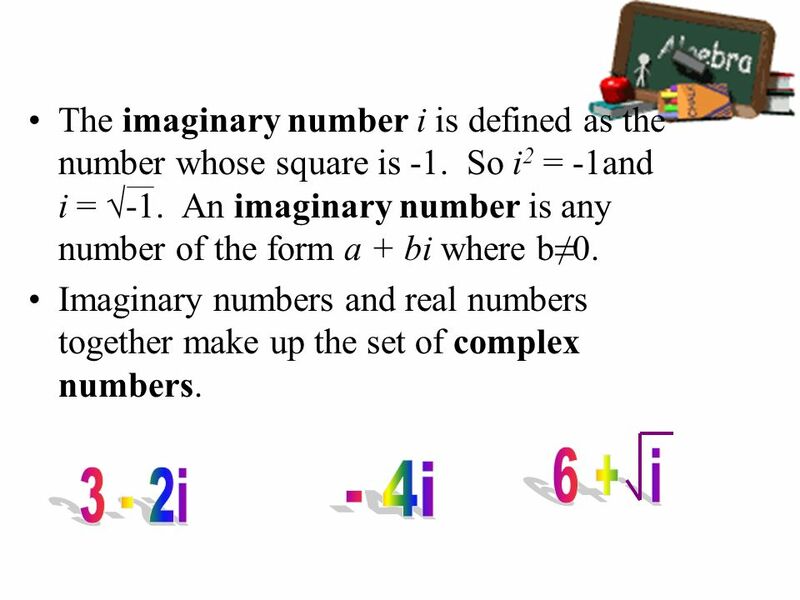 You have used real numbers, which include both rational numbers such as ½ and irrational numbers such as √2. 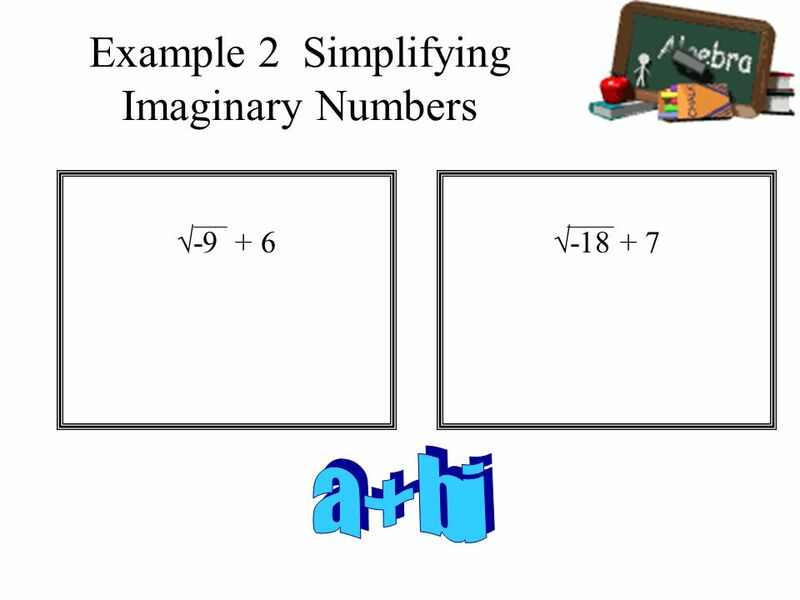 Now your number system will expand to include numbers such as √-2. 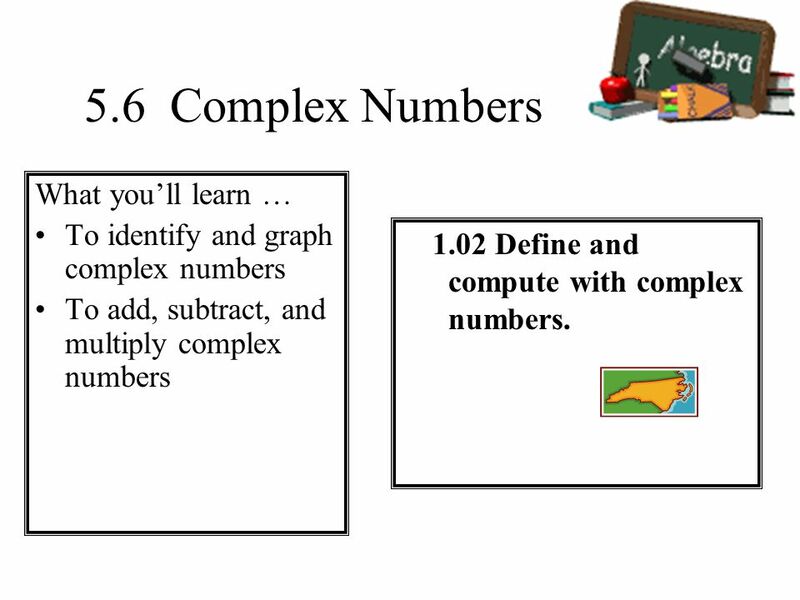 65 The diagram below shows the sets of numbers that are part of the complex number system and examples of each set. 66 You can use the complex number plane to represent a complex number geometrically. 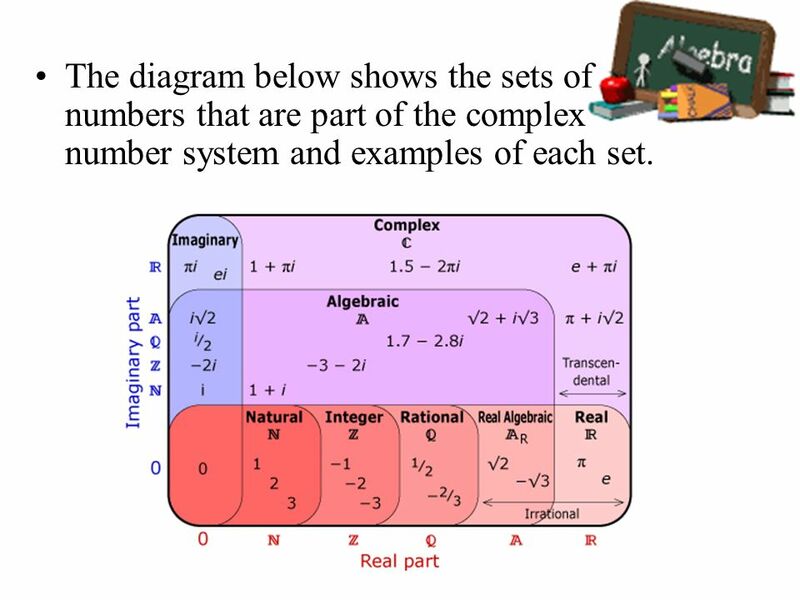 Locate the real part of the number on the horizontal axis and the imaginary part on the vertical axis. 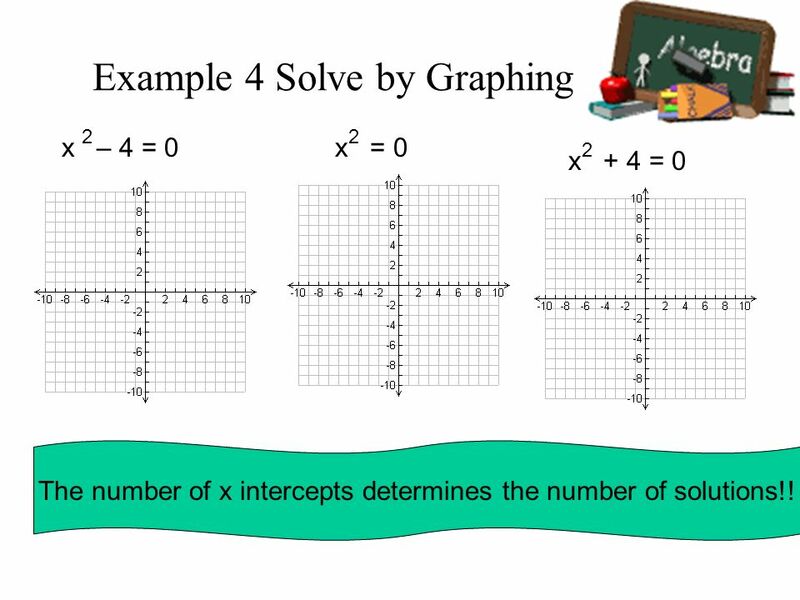 You graph 3 – 4i in the same way you would graph (3,-4) on the coordinate plane. 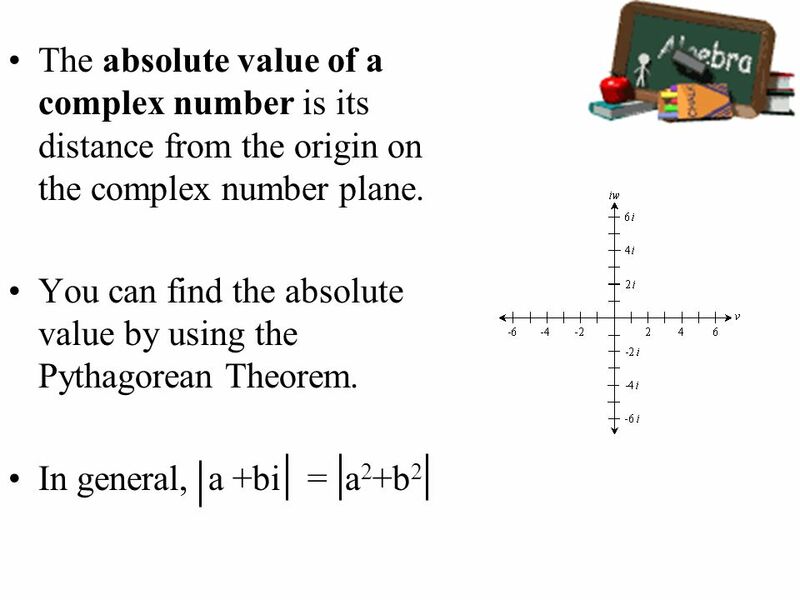 67 The absolute value of a complex number is its distance from the origin on the complex number plane. Find the additive inverse of -2 +5i. 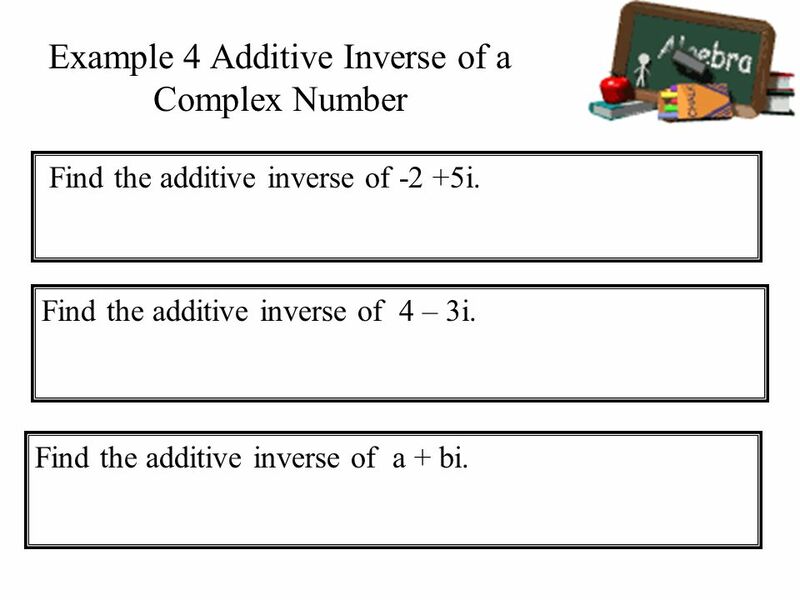 Find the additive inverse of 4 – 3i. 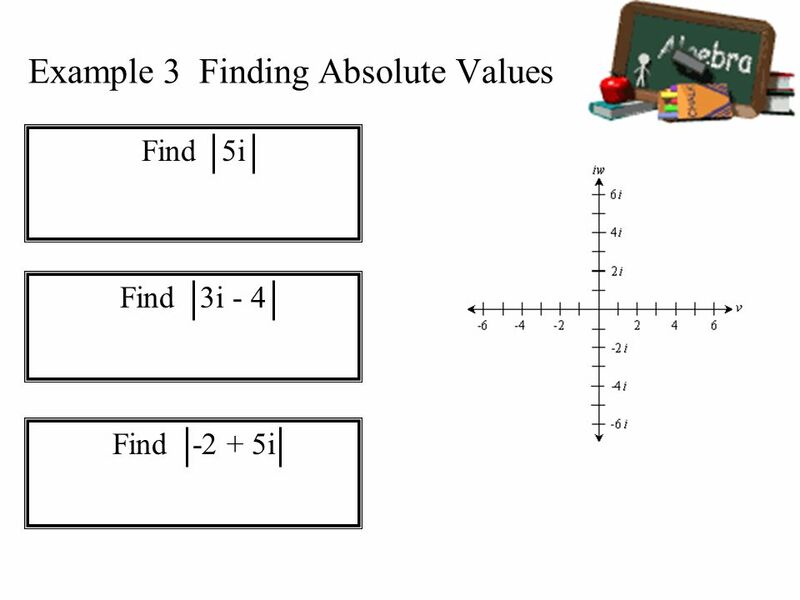 Find the additive inverse of a + bi. To solve equations by completing the square To rewrite functions by completing the square 2.02 Use quadratic functions and inequalities to model and solve problems; justify results. Solve using tables, graphs, and algebraic properties. Interpret the constants and coefficients in the context of the problem. 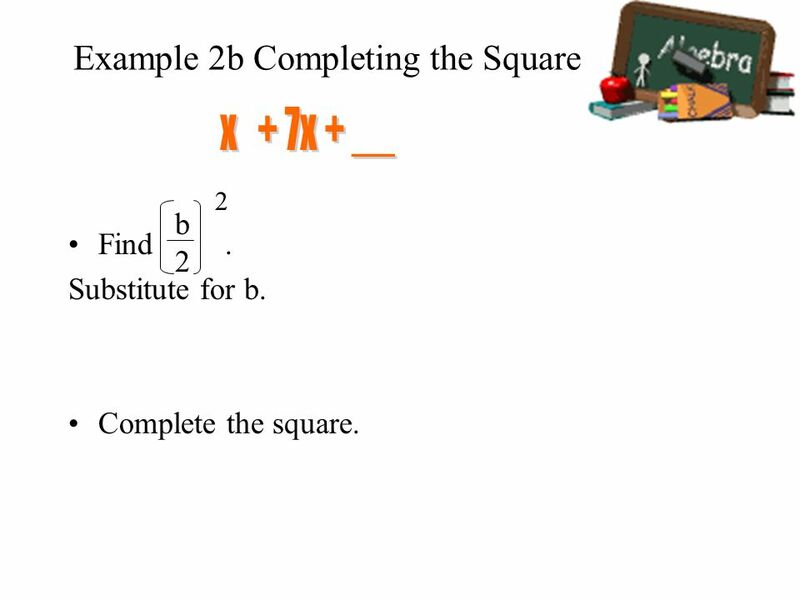 x + 7x + __ 2 b 2 Find Substitute for b. Complete the square. 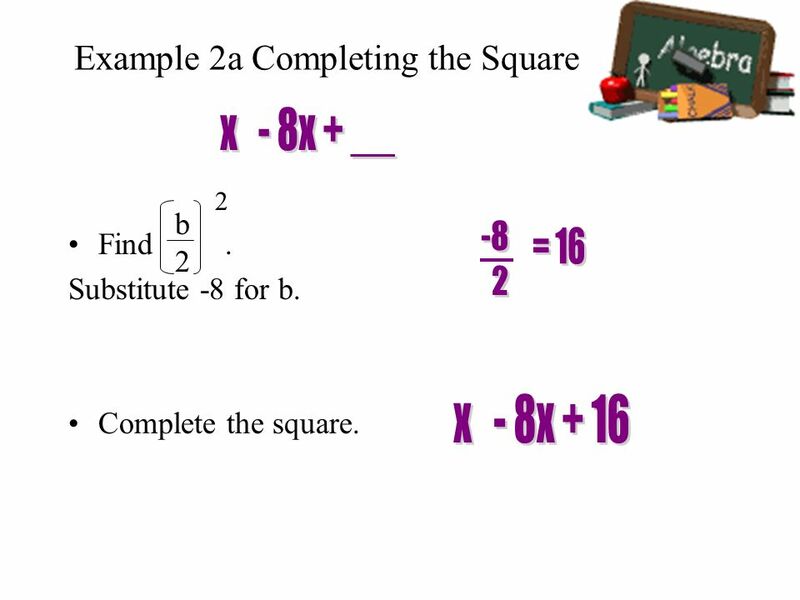 Solve the following equation by completing the square: Step 1: Rewrite so all terms containing x are on one side. 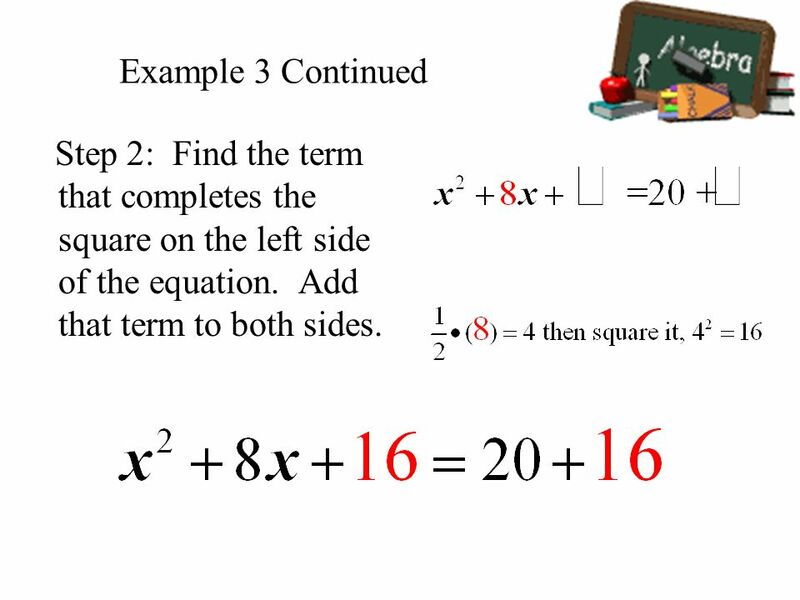 81 Example 3 Continued Step 2: Find the term that completes the square on the left side of the equation. Add that term to both sides. 82 Example 3 Continued Step 3: Factor the perfect square trinomial on the left side of the equation. 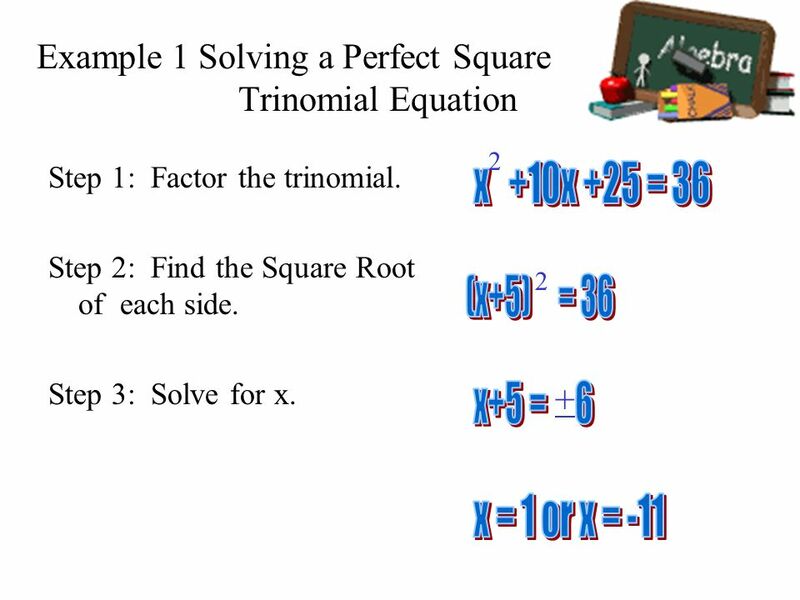 Simplify the right side of the equation. 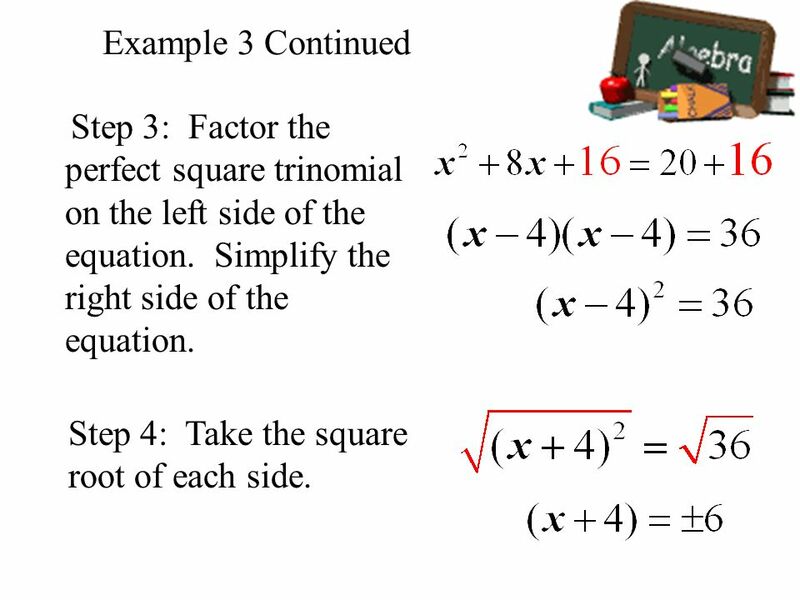 Step 4: Take the square root of each side. 83 Example 3 Continued Step 5: Solve for x. To solve quadratic equations by using the quadratic formula To determine types of solutions by using the discriminant 2.02 Use quadratic functions and inequalities to model and solve problems; justify results. Solve using tables, graphs, and algebraic properties. Interpret the constants and coefficients in the context of the problem. 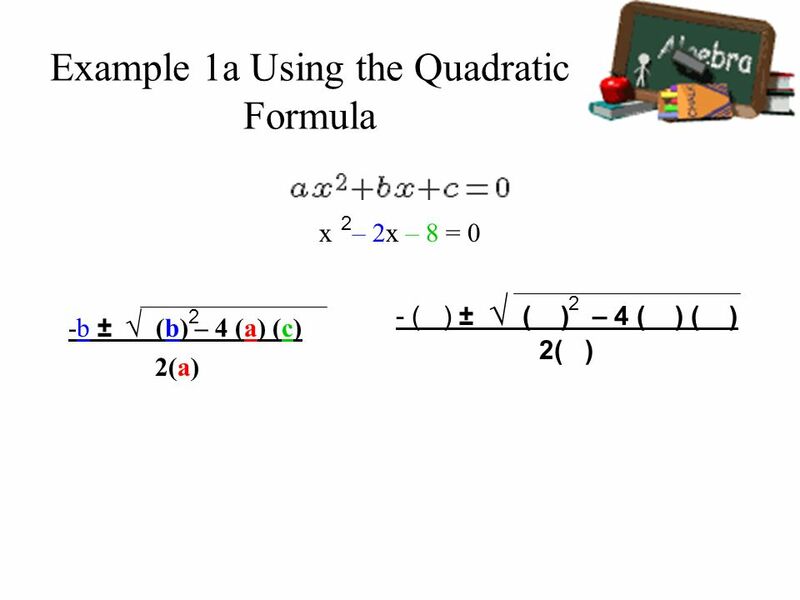 Learned to use quadratic functions to model real-world data. 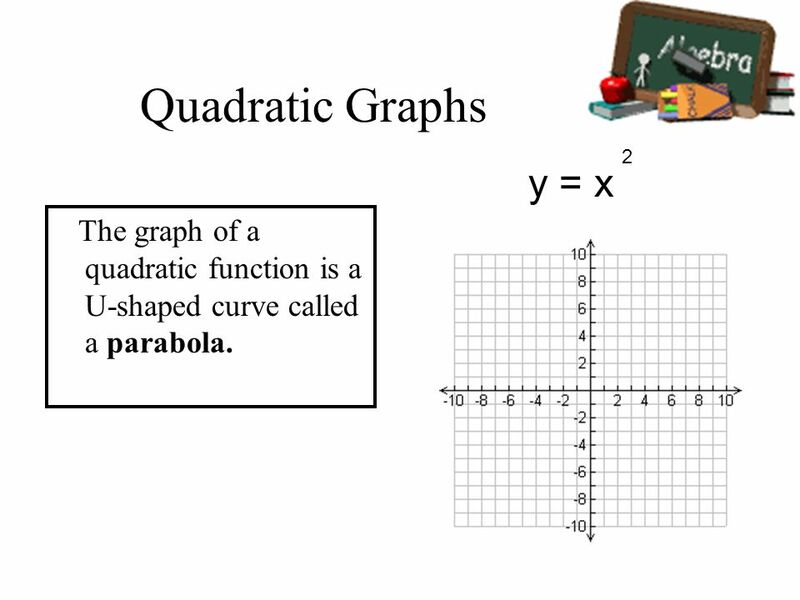 Learned to graph and to solve quadratic equations. 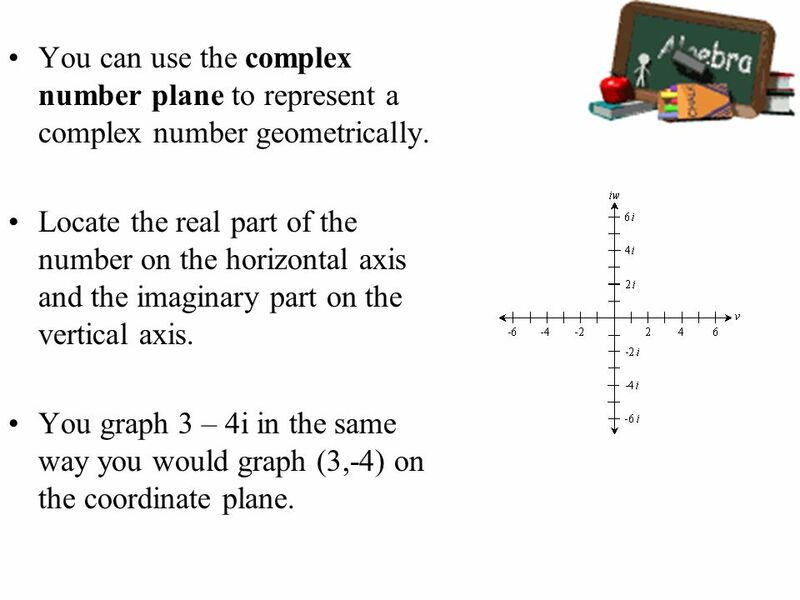 Learned to graph complex numbers and to use them in solving quadratic equations. 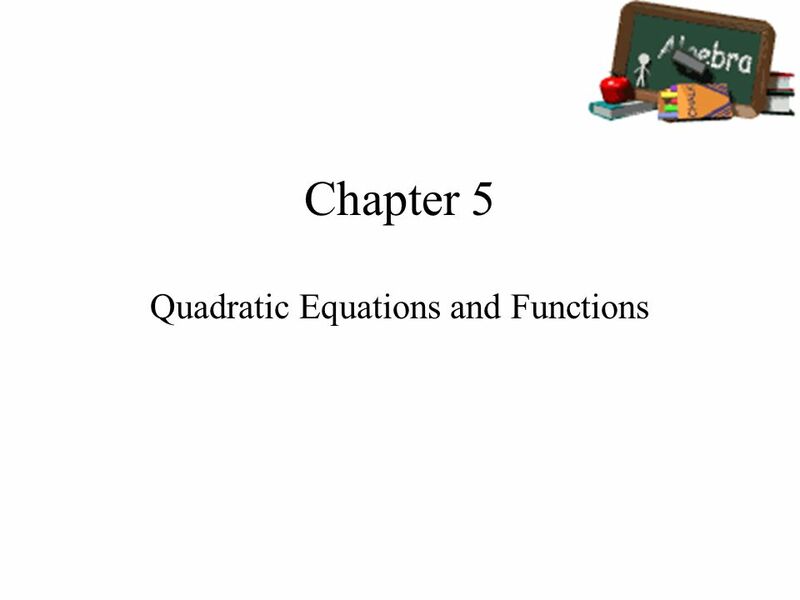 Download ppt "Quadratic Equations and Functions"
5.1 Modeling Data with Quadratic Functions. Quadratic Function: f(x) = ax 2 + bx + c a cannot = 0. Do Now 4/13/10 Take out homework from yesterday. MM2A3c Investigate and explain characteristics of quadratic function, including domain, range, vertex, axis of symmetry, zeros, intercepts, extrema, intervals. 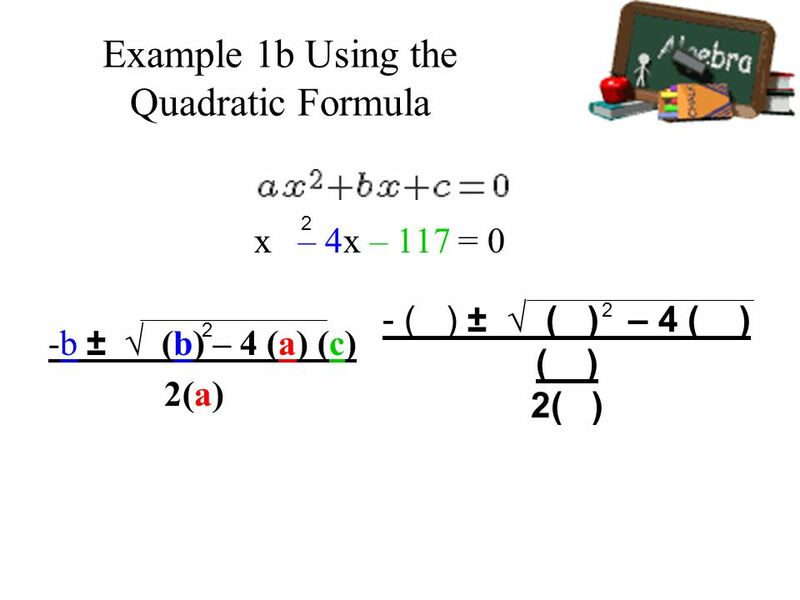 Solving Quadratic Equation by Graphing Section 6.1. 13.2 Solving Quadratic Equations by Graphing CORD Math Mrs. Spitz Spring 2007. 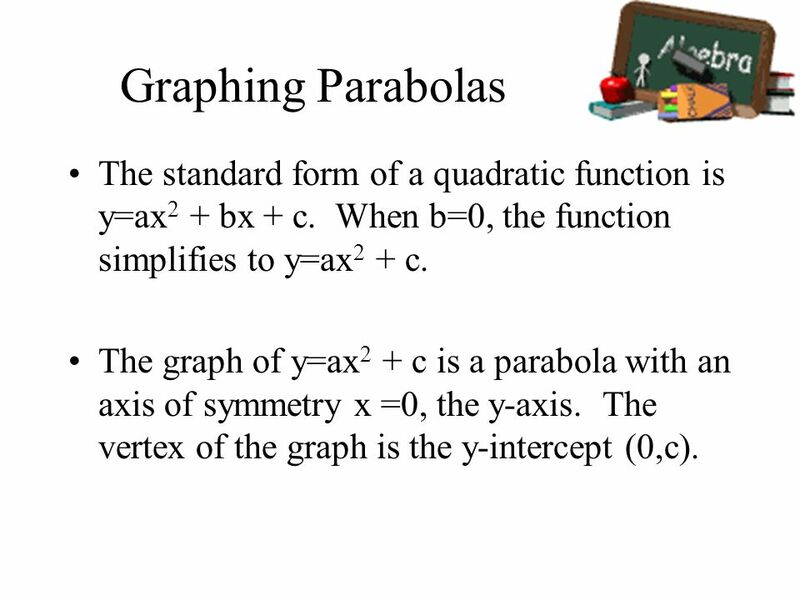 1.The standard form of a quadratic equation is y = ax 2 + bx + c. 2.The graph of a quadratic equation is a parabola. 3.When a is positive, the graph opens. 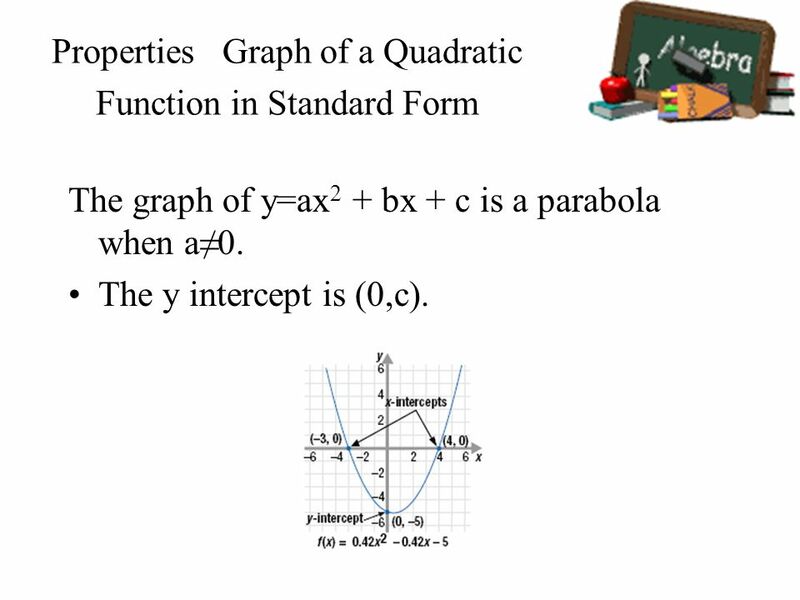 5.1 Modeling Data with Quadratic Functions 1.Quadratic Functions and Their Graphs. 5-1 Modeling Data With Quadratic Functions Big Idea: -Graph quadratic functions and determine maxima, minima, and zeros of function. 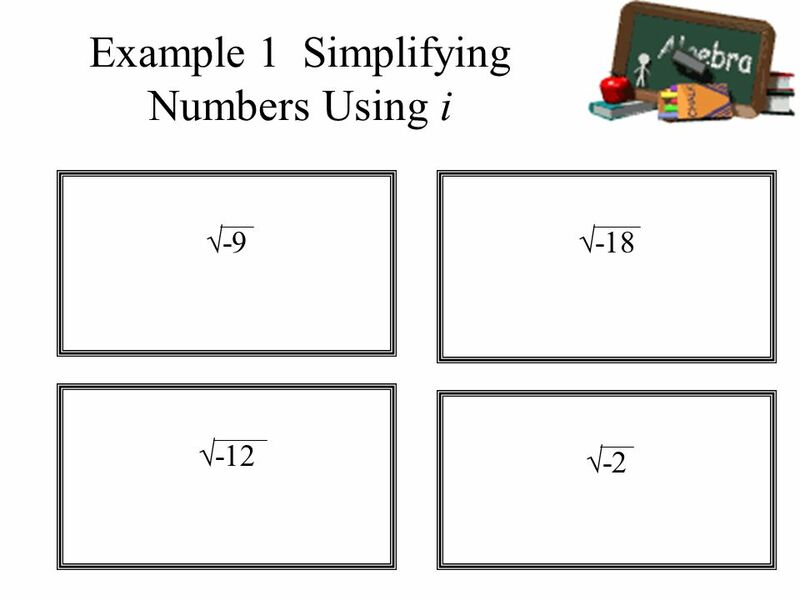 -Demonstrate and explain.